Fawn Creek Canyon from the canyon headwall. One of the many interesting geographic features of the Mount Shasta area is the headwaters of the Sacramento River. The largest and longest river in California, the Sacramento is a dominant presence throughout much of Northern California. The river meanders through the Sacramento Valley, passing through cities and towns, irrigating vast farmlands and providing recreation and habitat for people and wildlife. 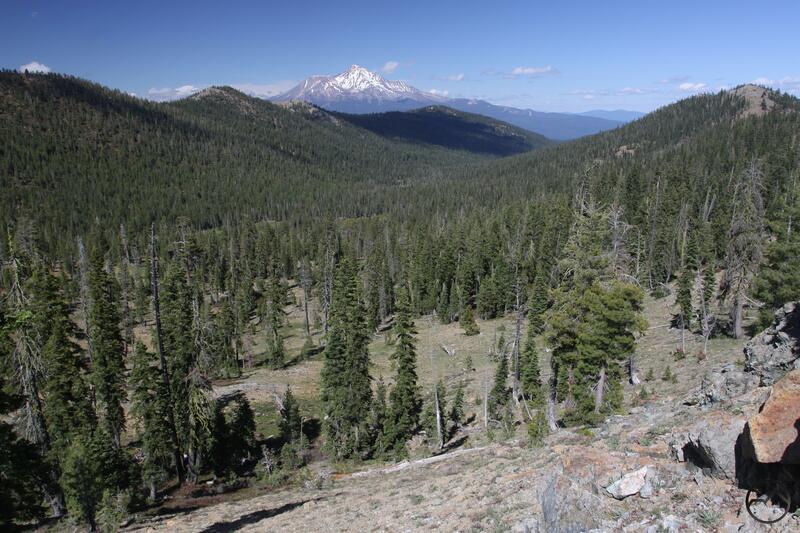 While the Sacramento River far from obscure, it is generally overlooked that the Mount Shasta area is where the river’s headwaters are located. Beginning high up in the Trinity Divide, the river is divided into the three forks, each claiming a somewhat different character. The North Fork is the most remote and begins in an extensive complex of meadows. The spongy soil holds water like a sponge and slowly releases the liquid, giving rise to the river. The Middle Fork also has a few small meadows but is also sourced from a small group of lakes at the head of its canyon. The South Fork is much greater in scale. The river claims 10 named lakes near its source scattered through three lake basins as well as the large lakeless Soapstone Basin as its headwaters. The three lake basins see their share of hikers, though by many standards they are lightly used. Soapstone Basin, though nearly forgotten by most, does have a maintained trail leading through it that connects to the nearby Pacific Crest Trail. However, there is another part of the South Fork’s headwaters that goes completely under the radar. Fawn Creek Canyon is almost completely overlooked and is utterly anonymous to all but a few devotees of the Trinity Divide. The upper meadow in Fawn Creek Canyon. Located just north of the South Fork of the Sacramento River, Fawn Creek Canyon is a lonely mountain valley. Sandwiched between White Ridge to the North and Bear Ridge to the south, the canyon is blanketed in an excellent forest of lodgepole pine. Neither ridge is exceptionally rugged but they do claim some craggy protrusions breaking through the forest. The lowest part of the canyon is narrow and rugged as it approaches the South Fork. Fawn Creek tumbles down a series of small cataracts as it speeds through this section. The upper portion of the canyon takes on a much different appearance. Exhibiting the classic u-shaped form of valleys that have experienced the passage of large glaciers, it is easy to imagine a large sheet of ice gouging at rocky protrusion and leaving a uniform landscape in its wake. 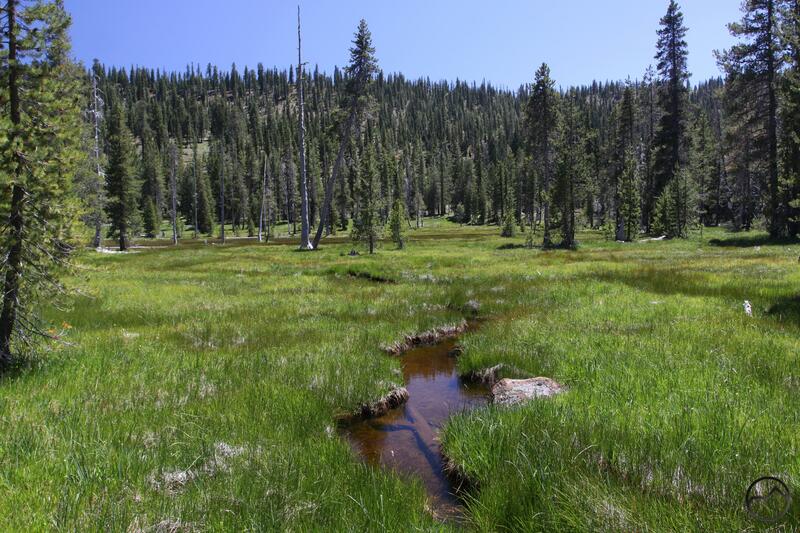 Although there are no lakes in Fawn Creek Canyon (often the remnants of glaciers) there is still a large complex of meadows in the upper section. The meadow is broken up into three sections. The lowest of the three is the least extensive and is intruded by numerous trees. 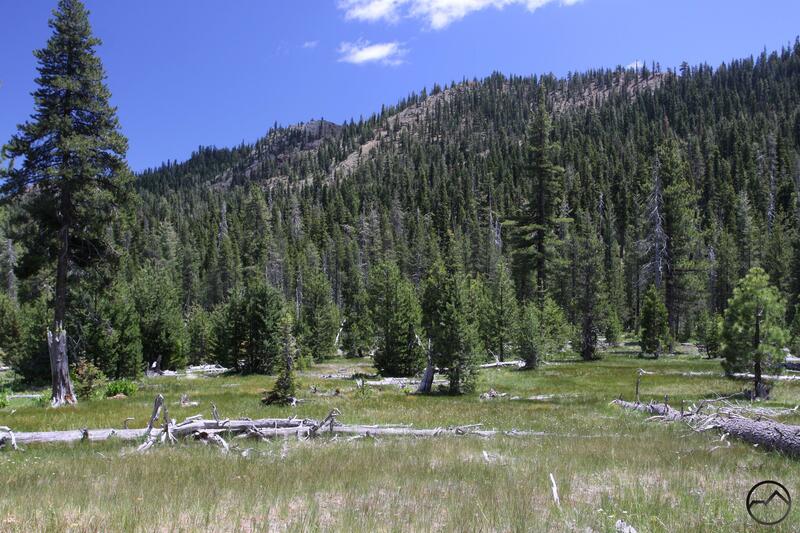 The middle meadow is very attractive and has some nice views of rocky points along the rim of Bear Ridge. The upper meadow is by far the nicest. It is incredibly lush and it is possible to observe Fawn Creek developing as small spring-fed streams combine and begin the journey down to the South Fork. The upper meadow is hemmed in by the headwall of Fawn Creek Canyon, which, while not particularly craggy, is still a scenic sight from the lush grasses. Add to this mix some great wildflower displays in the meadows and Fawn Creek Canyon can be an idyllic mountain hiding place. Access to Fawn Creek Canyon is not difficult. A road climbs up from the South Fork and passes the lower two meadow areas before stopping short of the final, upper meadow. The obscurity of the canyon is protected in large measure by the obscurity of the road and the numerous other attractions in the South Fork area. The road finally ends near the middle meadow at a large turnaround. The road actually continues beyond the turnaround but it has been condemned and quickly decays to an unpassable state. Nonetheless, the old road makes a convenient trail to hike up to the upper meadow. Though the road crosses a few wet spring areas, it stays a fair distance away from Fawn Creek. Nonetheless, the road and creek do approach each other as the meadow approaches and after a short cross-country jaunt, the meadow unfolds beautifully at the head of the canyon. Few people make it up this far into Fawn Creek Canyon and it makes a wonderful place to pitch a tent and enjoy a remote, wild and serene meadow. If there is any drawback to Fawn Creek Canyon, it is the lack of great views. There are no great views of Mount Shasta or Mount Eddy. The best way to get a sense of the canyon is to climb up to the top of the headwall where the PCT traverses the west end of the canyon. From there both White Ridge and Bear Ridge extend eastward and Mount Shasta looms majestically above everything. This view can also be accessed via the PCT from the Gumboot trailhead. From there, hikers can drop down into the canyon and enjoy the upper meadow before climbing back out of the canyon and returning to the trailhead. nice to see there are current pic’s of our favorite spot! Still gorgeous! Thank you! How exactly to acces to Fawn canyon? Which road to take first?